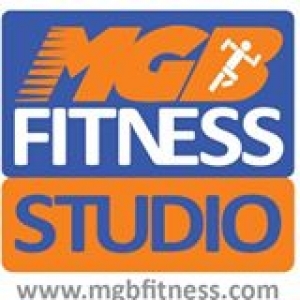 MGB Fitness Studio, Southampton, is a brand new training and treatment facility that allows exercise, nutrition and physical therapy professionals to deliver the highest quality training, treatment and educational sessions to their clients. 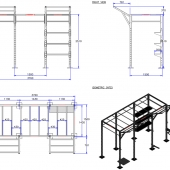 To design and manufacture a bespoke functional frame by creating a long row of monkey bars between two concrete columns (5.1m apart). 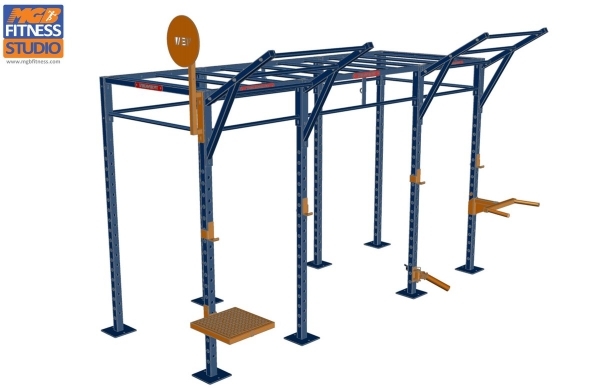 The design was to include upright supports that would incorporate 4 power racks within the frame to offer the potential to operate 4 squat / weight lifting stations simultaneously. The custom frame was to include numerous laser cut sections, thus creating a modular & versatile functional unit that would house many different functional attachments. 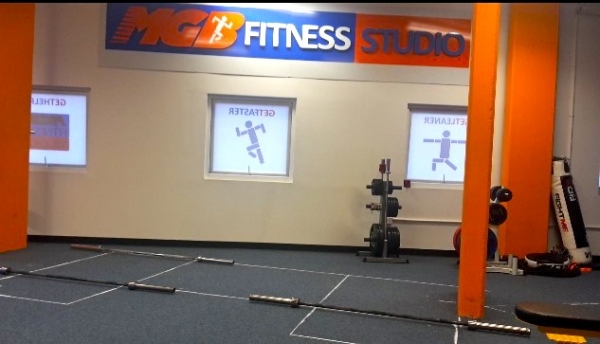 With space in mind, MGB Fitness also required a compact dual adjustable pulley strength machine for the facility. 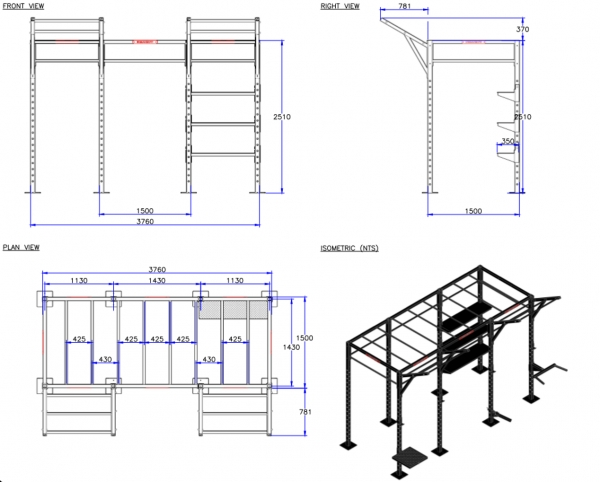 From the initial sketch drawing provided by the client, we produced a design and agreed to design, manufacture and install a unique frame, 3.8m wide by 1.5m depth. 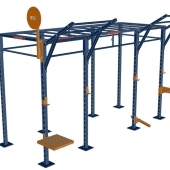 The custom rack sat perfectly between the two columns ensuring users had enough room to use the 4 power racks, with sufficient space to load and unload Olympic bars up to 7ft in length. This UK manufactured rig was produced in the client's desired blue and orange colours, and supplied with the following attachments; two 45 degree pull up wings, 4 sets of j-hooks and safety spot arms, adjustable plyometric step platform and Grappler for Olympic bars and a rebound board. 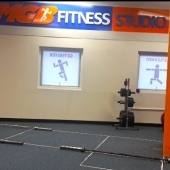 This unique frame also has the option to house additional accessories should MGB Fitness decide to purchase in the future. We also supplied also installed a new Inspire Fitness FT1 Functional Trainer within the studio. "As a small business, the investment I had decided to make into expanding my equipment was somewhat daunting. However, from the offset Craig was able to understand my specification and use his experience to translate my needs into a bespoke design. Craig was patient with me while I spent several weeks moving back and forth with ideas and, once the final design was set, he offered me a very competitive price and moved quickly to get the rig ordered and fitting booked. I and the team of fitness professionals who share the space are all delighted with the finished product which, while fitting within an awkward space, provides us with great versatility, durability, and is a feature piece within the training studio. Despite being a small independent training studio, I now have facilities to match any large commercial gym. I wouldn’t hesitate to recommend Craig and his company Craig Young Consulting and have already done so."